Since the 1980's, space scientists have generally accepted that the bubble of gas and magnetic fields generated by the sun –the heliosphere – moves through space, creating three distinct boundary layers that culminate in an outermost bow shock. This shock is similar to the sonic boom created ahead of a supersonic jet. Earth itself certainly has one of these bow shocks on the sunward side of its magnetic environment, as do most other planets and many stars. A collection of new data from NASA's Interstellar Boundary Explorer (IBEX), however, now indicate that the sun does not have a bow shock, creating more of a “wake” as it travels through space. 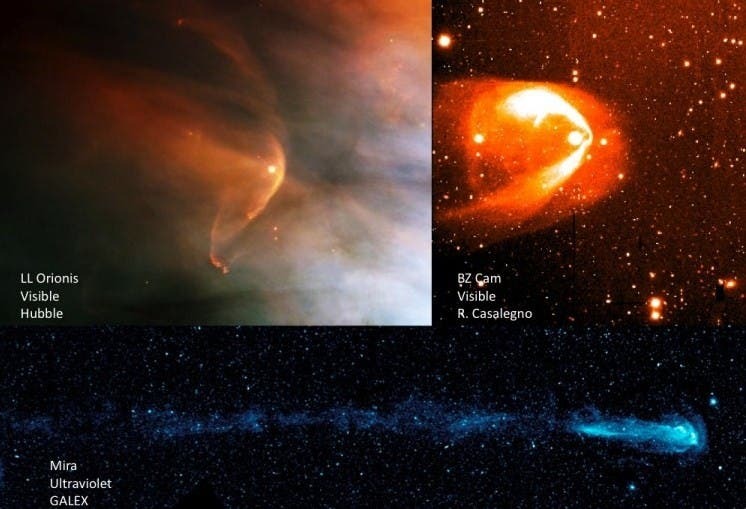 The image above taken by multiple telescopes shows bow shocks that exist around other astrospheres. The boundaries of the heliosphere have largely been assumed to be a series of three. The first is a fairly spherical boundary called the termination shock — the point where the solar wind streaming from the sun slows down below supersonic speeds. From there the wind continues more slowly until it collides with the material in the rest of the galaxy and is pushed back, deflecting around the outskirts of the heliosphere, streaming back toward the tail of the moving bubble. This second boundary is called the heliopause. The third boundary was thought to be the bow shock, formed as the heliosphere plowed its way through the local galactic cloud the same way a supersonic jet pushes aside the air as it moves. In a paper appearing online in Science Express on May 10, 2012, scientists compile data from IBEX, NASA's twin Voyager spacecraft, and computer models to show that the heliosphere just isn't moving fast enough to create a bow shock in the tenuous and highly magnetized region in our local part of the galaxy. "IBEX gives a global view. It shows the whole of this region," says Eric Christian who is the mission scientist for IBEX at NASA's Goddard Space Flight Center in Greenbelt, Md. and who was formerly the program scientist for Voyager. "At the same time the Voyager spacecraft are actually there, in situ, measuring its environment at two locations. The combination of IBEX and Voyager gives you great science and now the new IBEX results strongly indicate that there is no bow shock." The two Voyager spacecraft have confirmed the existence of the first boundary, and have seen evidence for the second as they move toward it. However, each Voyager spacecraft has seen different things on their respective trips – one moving in a more northerly direction, one moving more to the south. They've encountered different regions at different distances from the sun, suggesting the very shape of the heliosphere is squashed and asymmetrical. Scientists believe this asymmetry is caused by the force and direction of magnetic fields ramming into the heliosphere from outside, the same way a hand pushing on a balloon will force it out of shape. This was the first clue that there's a strong magnetic field exerting pressure on the outskirts of the solar system. Independently, IBEX has seen a well-defined band, or ribbon, at the edge of the heliosphere, believed to be defined by this external magnetic field. Other studies from IBEX have helped quantify the magnitude of the magnetic field, showing that it is on the strong end of what was previously thought possible. "We've seen one after another signature of a very strong magnetic field in the galactic environment," says Nathan Schwadron, a space scientist at the University of New Hampshire in Durham who is one of the authors on the paper. "That magnetic field influences the structure of the heliosphere and the boundaries themselves. That leads to a whole new paradigm." Along with increased evidence for a strong external magnetic field, IBEX has also provided a new measurement for the speed of the heliosphere itself with respect to the local cloud. "We recently analyzed two years worth of IBEX data, and they showed that the speed of the heliosphere – with respect to the local cloud of material – is only 52,000 miles per hour, instead of the previously believed 59,000," says David McComas at the Southwest Research Institute in San Antonio, Texas, who is first author on this paper and also the principal investigator for IBEX. "That might not seem like a huge difference, but it translates to a quarter less pressure exerted on the boundaries of the heliosphere. This means there's a very different interaction, a much weaker interaction, than previously thought." The heliosphere's boundaries lie roughly 10 billion miles away from Earth, but are nonetheless crucial for understanding our place in the universe. The heliopause provides some protection for our solar system from the harsh, radiation environment surrounding it. By knowing the nature of these boundaries, scientists can start to better understand the propagation of particles that do have enough energy and speed to make it into our environment. "Imagine the point at which Voyager crosses the threshold of the heliopause and either does or does not see what IBEX is predicting," says Schwadron. "There will be enormous opportunities for scientific advancement."